In Rex Burkhead’s first career start at running back, the fourth-year pro set career-bests with 27 carries, 119 rushing yards and two touchdowns in the Bengals’ 27-10 victory over the Ravens, and offensive lineman Andrew Whitworth noted it was “unfortunate” for the Bengals. It wasn’t unfortunate for Sunday’s result, but for the team’s ability to keep Burkhead, 26, who will enter free agency for the first time this offseason. “He's a free man and I'm sure teams are going to turn that film on and there are going to be a lot of teams that are going to be real interested in Rex Burkhead,” said Whitworth, who will enter free agency as well. 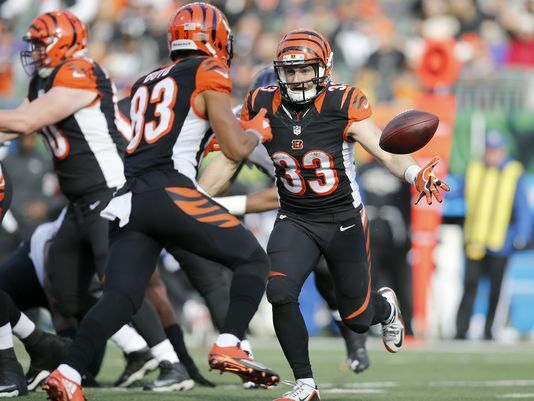 Drafted in the sixth round of the 2013 draft, Burkhead played mostly on special teams until this season, when injuries to Jeremy Hill and Giovani Bernard finally gave him an opportunity to display what he could do. The fact he capitalized on his chance didn’t seem to surprise anyone in the Bengals’ locker room. It didn’t take long for him to show that ability, rushing for 17 yards on his first carry of the game. Burkhead noted it’d been since his college days at Nebraska that he’d recorded more than 20 carries in a game. Getting 27 carries, Burkhead had nearly half of his career carries (60) and rushing yards (256) in just the one day. Ravens coach John Harbaugh noticed — “Rex Burkhead is a really good player. He’s really special” — and he probably isn’t alone among teams around the league. Hill and Bernard are still under contract for 2017, making a return by Burkhead difficult, especially if he feels he can play a larger role - and he hasn’t been given that opportunity in his four years in Cincinnati. Bengals head coach Marvin Lewis said he’d like to re-sign Burkhead, but with the other two already under contract and several other key pieces also needed to be resigned, it seems unlikely. But he wasn’t blind to what Sunday meant for his future. Given a chance, perhaps his first 100-yard game as a pro won’t be his last. “It was absolutely a pride factor," said Bengals guard T.J. Johnson, who roomed with Burkhead after they were drafted together in 2013. "I love Rex, I love the way he runs. He’s a guy that you want to fight for."